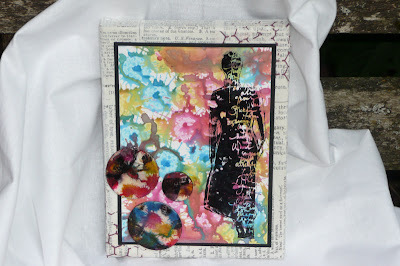 Eclectic Paperie: Shrink Plastic Distress Stain Splats! Hi, Lucy here again with a bit of an experiment to see if it was possible to do Distress Stain splats on shrink plastic. 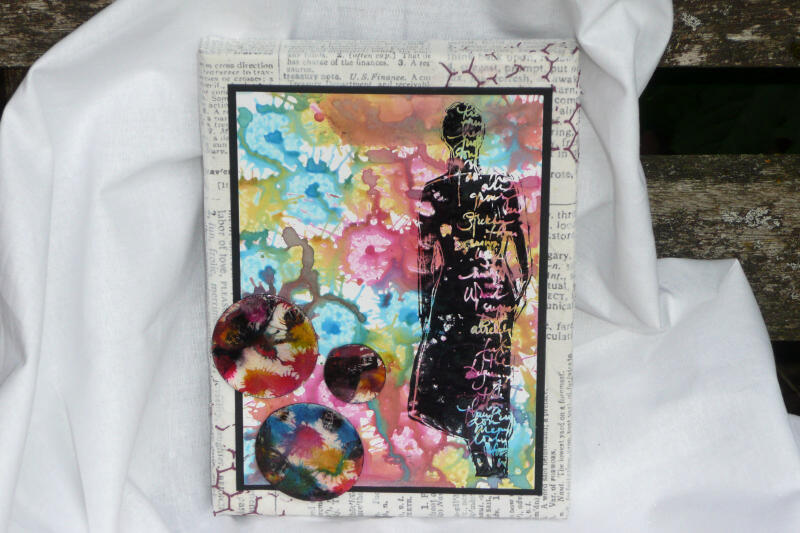 I've used this gorgeous Dina Wakley Silhouette Script Woman stamp but I'm starting with my embellishments, the shrink plastic circles, to allow for drying time. I wouldn't normally use a water-based medium on shrink plastic so I used the rough side of a piece of translucent shrink plastic and evenly applied gesso using cut n dry foam and let it dry naturally, to provide a key on which to apply the Distress Stains. 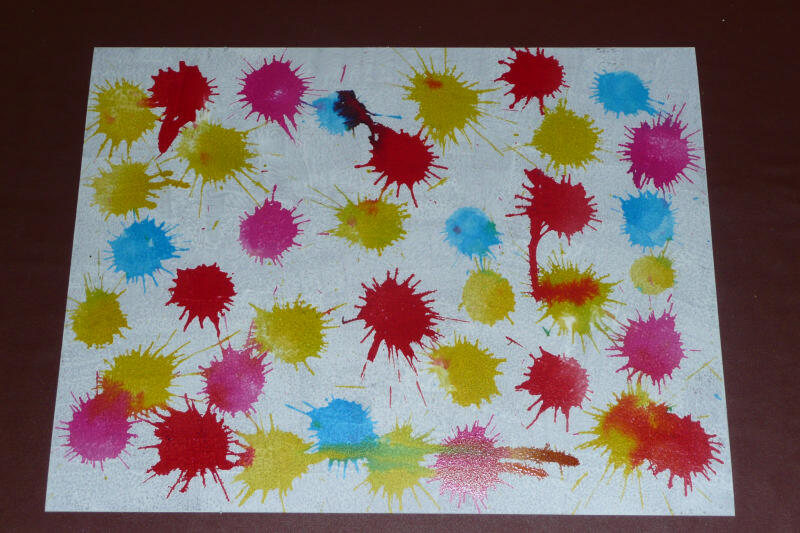 As they have dabber tops, it is great fun to zap them down hard on a surface so you get a splatter effect. I used vibrant colours: Tumbled Glass, Mustard Seed, Picked Raspberry, Wild Honey, and Fired Brick. Squeezed Lemonade would be a good one if you have that colour. I let them run a tiny bit but not too much and I spaced them out to allow some white space as they will be closer together when you shrink them. I put this aside to dry and did the same thing on a piece of glossy cardstock, but with the colours a little closer. I then stamped the Dina Wakley stamp in Jet Black StazOn on the cardstock. Choose your size of canvas such as a 6 x 6 here (I just used one I already had in my stash but cut your cardstock to fit the canvas you have used). Cover it with Tim Holtz Tissue Wrap using gel medium and apply gesso with cut n dry foam. Using TCW Reversed Chicken Wire Stencil apply Viva Ferro in Blackberry to the corners that will show under your images as shown here. 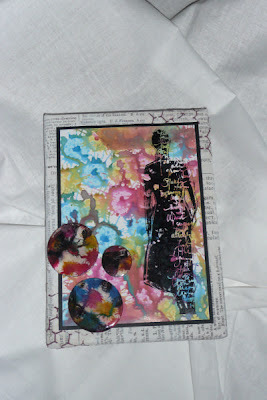 Returning to your shrink plastic, die cut circles in different sizes using Tim Holtz sized circles. You will be able to get plenty from the one sheet so you might like to put some into a little bag for other projects, or perhaps cut other shapes. Ink up the Script Woman again and stamp the edges of the circles with the script part of the stamp for some extra interest. Dab the circles with Versamark and dip in Clear Embossing Powder, and then shrink with a heat tool. Edge with a Black Sharpie. Finally, assemble the canvas by mounting your coloured cardstock panel onto black cardstock to create a border and pop it onto the canvas so that the stencilling shows around the edges. Then arrange your shrink plastic circles in a pleasing fashion - they will be really glossy now! I honestly wouldn`t have thought about using the stains on that and I adore the effect it gives and sooo glossy, will be giving this a go...this girl loves to splodge and splat, thanks for the idea!! Great work and looks like lots of fun! It looks fabulous! Love all those splats and goes so brilliantly with the stamp. How fun is this! I was just down in Cinci at Stampaway, and there were alot of demo's with Shrink Plastic- it must be making a come back!!! I LOVE the distress stains on it! Awesome project! 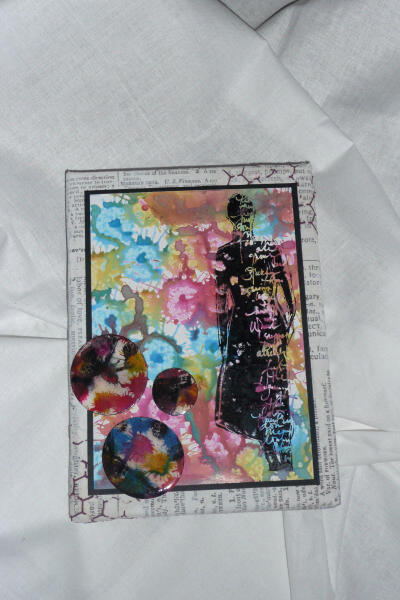 The colourful splats look great in the two different sizes and fab with the silhouette woman! This is such splatting fun! Love this project, Lucy! The AI splats on shrink plastic is so clever and great embellishments! You know those would make fun jewelry! Hugs! oh wow that is awesome. I LOVE LOVE LOVE splatters and would have never thought to use water based with plastic. Great card and great technique. Wow, this looks fabulous and what great out of the box techniques, the end result looks amazing! Great project! Thanks for reminding me of that shrink plastic I have in my stash! Fabulous project, Lucy. Makes me want to pull out some shrink plastic this very instant. Such a cool background technique - the shrunken splats look amazing - brilliant make, Lucy!